All tracks arranged, composed and programmed by element012 in 1999, with a midi tracker using only general midi sounds. The original CDr album was distributed to a random audience on various partys and festivals, about 100 pieces. 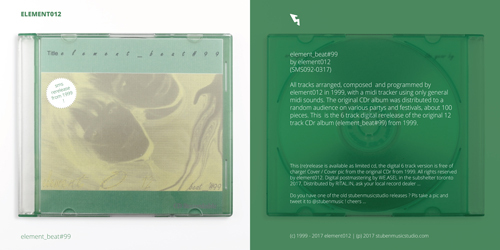 This is the 6 track digital rerelease of the original 12 track CDr album (element_beat#99) from 1999.